Bradley International Airport to begin direct flights to Denver, Raleigh and Orlando with Frontier Airlines. 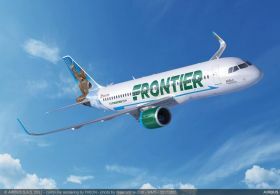 The Connecticut Airport Authority (CAA) is pleased to announce the expansion of Bradley International Airport’s roster of airlines with the addition of low-cost carrier Frontier Airlines. The airline will debut its inaugural service with a nonstop route to Denver. Headquartered in Denver, Frontier prides itself on delivering the company’s signature Low Fares Done Right service to customers. Following the announcement of the anticipated launch of nonstop services to Denver, the Connecticut Airport Authority (CAA) has also shortly thereafter announced the debut of new, nonstop services from Bradley International Airport to Raleigh-Durham International Airport (RDU) and Orlando International Airport (MCO) on low-cost carrier Frontier Airlines. The service to Denver will commence on March 28, 2019 on an Airbus 320. It will operate seasonally on Tuesdays, Thursdays and Sundays. The service to Raleigh-Durham will commence on April 30, on an Airbus A320. It will operate seasonally on Tuesdays, Thursdays and Sundays. The service to Orlando will commence on May 1, on an Airbus A321. It will operate seasonally on Mondays, Wednesdays, Fridays and Saturdays.